I'm in process on my beananimal drain system for my 200g w/ external OF. The heavy duty gate valves I got for 1.5" plumbing from Bulk Reef Supply are very heavy and don't offer any bracketing for attaching them to supports. So I'm wondering if I should plan for it to be "upright" (perpendicular to the standard valves on the beananimal designs). My question is, would it affect operation of the siphon channel to have a two right angle elbows, one before and one after the gate valve? Tony I would avoid the use of elbows if possible. Is there a way you can secure the plumbing below and/or above the valve? okie dokie, i will work something out. thanks for the excellent links! Bean, don't think I ever told you thanks, but I have my overflow working as it should. I am very happy with the design and the quietness of the system. I am still just running water through the system looking for problems, but haven't had any more. I moved the return drain lines up and down in the sump until I found a balance and it works great now. Thanks! "No honey I can't just send it back. It's all wet and they won't take it back now!" I need some advice although it's not related to your design I thought that with your experience of overflows you could help. I have a fuge with a discharge chamber which has a gravity drain back to my sump which is about 12" lower. Same problem. I went to Lowes and picked up a tee and cap. I cut off the vertical PVC and added the tee with the hose connecting to the horizontal and the cap on the vertical. I installed a John Guest valve fitting on the top of the cap and ran a 1/4" line into the fuge discharge chamber (just like your design). My thinking was that at pump shutdown for feeding the water in the fuge discharge chamber would be uncovered and break the syphon. Didn't work so I closed the valve and I'm back to where I started. Any ideas on how I can keep the water level high with a low flow? "Never in the field of human conflict was so much owed by so many to so few. " Sir Winston Churchill praising those young RAF pilots. Click on my name for drop down list and select "Visit EnglishRebels Home Page" for my build thread. Current Tank Info: 60x30x24 200G AO custom glass tank, basement equipment room, 30G and 55G Fuges, LifeReef sump & 30" skimmer. Last edited by Misled; 10/30/2017 at 06:50 PM. The reduced flow allows air into the setup due to the siphon.... you need to resrtrict the the discharge line to allow a lower volume siphon. However, in doing so you will also create more of a likliehood of a blockage causing a flood. Better setup... a siphon with an open channel/emergency. You can valve the siphon back to get things in balance just like the full size overflow. I had a local glass shop cut me the (2) pieces for maybe $25. I used silicone to build the box and attach it inside the tank. Use glass for a glass tank.. and acrylic (solvent welded) for an acrylic tank. 1) raise the open channel by 1/2" - 1" to force water into the siphon. 2) ensure that the siphon standpipe is not submerged too far into the sump. 3) you can drill a small hole or two in the siphon standpipe just above the normal operating waterline of the sump. Here is mine almost done. What do you think? The other bulk head is for the return. I'm planning on doing this on a smaller scale on a smaller tank (24 x 24 x 20) and plan on using 3/4" fittings. I believe I asked you previously if that was adequate sizing for about 300-400 GPH flow (obviously not much) and you said it should be fine. Anyway, one of the things I'd like to do is use 3/4" black vinyl tubing and John Guest or Mur compression fittings rather than spa flex, rigid PVC or hose barbs to make connections to the ball valves and bulkhead fittings. Do you think these would be effective in terms of being air tight? I like the idea of using them because they make things a little more modular and easier to disconnect for maintenance and modifications. I've been reading this post for close to 3 hours now and your answers seem to be thorough, honest, and easy to understand. I'm fairly new to the hobby and currently running a 72gal bowfront that slurps like crazy and your improved design seems to be what I'm looking for. I am currently brainstorming a setup of a 120 gal for my finished basement and incorportating the aquarium into the wall as a room divider. My original intention was to seperate my large room into two seperate rooms with the aquarium visible from three sides, but not sure how to run the drains. The aquarium will be 48"x24" and my original thought is to put the 3 drains on the unvisble side, but not sure there will be enough surface skim even if I run the overflow the full 24" along the side. Can you or anyone feed me some ideas and knowledge? Or do I need to loose the third side view of the aquarium and have overflows on both sides and only have the aquarium viewed from the two seperate rooms. Keep in my I am brainstorming and gather information to make up my design. The aquarium will be glass and I will have to ensure the sides are not tempered, so assuming they're not tempered what are your thoughts. The 24" of surface skimming may not be "ideal" but it is still more than MOST 120G tanks have. I would use an external overflow box so that it is not visible from the display area. I would use (1) or (2) large closed loops plumbed through the end wall and/or bottom of the tank and run them with an Oceans Motions or Variable Speed Reeflo Pump (talk to Reeflo, or look for the thread by LiveForPhysics here at RC. I prefer the "room divider" look instead of the peninsula look, but to each their own. I am not sure how they do with negative pressure. I would imagine they should be fine though. Thanks Bean. I'll give a try and post some photos if they work because it would plumbing and any necessary modifcations really easy (not that glueing and threading fittings together is difficult). I agree with you on the room divider vs. the pennisula. I finally brought the tank home today and sat it in the room to acutally see what I would be working with and am swaying toward the room divider. With this in mind I will probably have overflows on each side of the tank for a total of 48" and more uniform skimming. What do you think of this idea? How would I setup drains if I were to do this? You mentioned an external overflow, I've always read in the event of a power failure the overflow may loose its siphon and cause the return pump to overflow the tank and cause the pump to run dry. Is there a way to ensure the overflow would begin siphoning normally in the event power was returned without manual priming? If this is the case not lugging this heavy aquarium to have it drilled would be great. Again thank you for your help. Thankyou for the info on the close loop that was my next area for developing. The logistics of trying to sync an overflow on EACH end of the tank is not likely worth the trouble. Produce good surface flow and the single 24" overflow will likely be fine. Use one end to feed the closed loops if you like. I understand what you mean now. 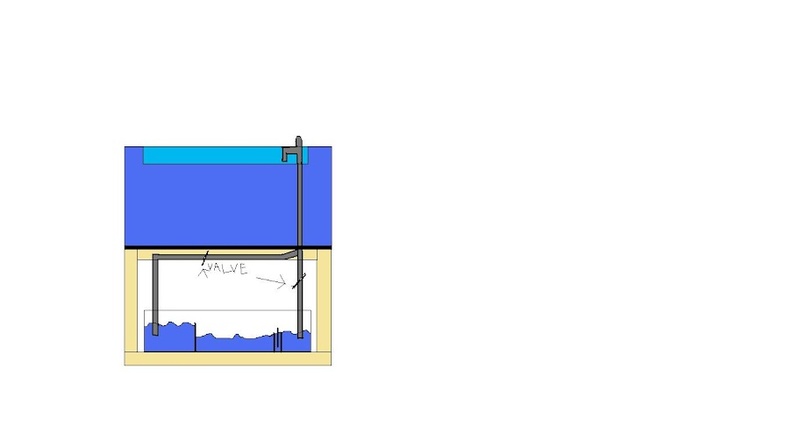 This would work great and I will probably use two closed loop systems to churn enough surface flow since there is such a long surface to be skimmed. Perhaps this is a silly question, but I am working on building this very system for my new 90 gallon and was wondering if it absolutely had to be True Union ball valves? If I don't use those what will I be losing?